Oswego County Opportunities, Inc. (OCO) will hold their annual Golden Opportunities Raffle Drawing this upcoming April 2nd. The drawing will be held in conjunction with OCO’s Annual Bowl-A-Fun and 45th Anniversary Birthday Bash event that will be held that day at Lakeview Lanes in Fulton. The raffle drawing will take place at 5:30 at OCO’s Fulton Office location. 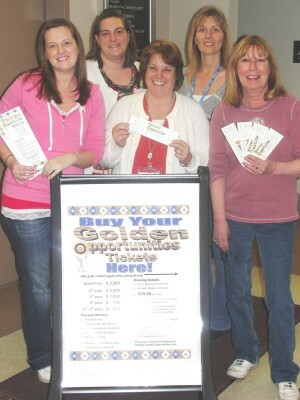 Shown promoting the raffle are from left to right: Stephanie Langdon; Holly Bristol; Sandy Wells; Penny Halstead; and Deb French. FULTON, New York (March 14, 2011) – Oswego County Opportunities, Inc. (OCO) will hold their annual Golden Opportunities Raffle Drawing this upcoming April 2nd, and eight lucky individuals will walk away with cash prizes of up to $10,000, according to Diane Cooper-Currier, Executive Director at OCO. The drawing will be held in conjunction with OCO’s Annual Bowl-A-Fun and 45th Anniversary Birthday Bash event that will be held that day at Lakeview Lanes in Fulton. The raffle drawing will take place at 5:30 at OCO’s Fulton Office location. The annual fundraising raffle directly benefits Oswego County Opportunities, Inc. and the extensive human services and outreach they provide the Oswego County community. According to Cooper-Currier, 1,000 tickets are sold for the drawing, and prizes range from $5,000 to $250. Tickets are $20 each and available at: OCO, Inc. 239 Oneida St., Fulton; OCO Midtown Office – Lower Level, Oswego; and a printable ticket application is available at www.oco.org. If fewer than 1,000 tickets have been sold, prizes equal to 50% of tickets will be awarded. People are not required to be present to win, and must be 18 or older to participate. Oswego County Opportunities, Inc. (OCO) is a private, nonprofit human service agency that has been supporting communities throughout Oswego County since 1966. Over a year’s time, OCO touches the lives of nearly 28,000 people in Oswego County. Their ongoing efforts provide educational services to the young, support for our youth, assistance for the homeless, meals for the elderly, health care for the whole family, guidance for those diagnosed with a mental illness, housing for the disabled, safety for the abused, as well as transportation. For additional information on Oswego County Opportunities, Inc. please visit www.oco.org or call (315) 598-4717.